Here are a few photos of Studio B taken in 2003. They include the Studio B production area, sound desk, vision and lighting desk, Calrec mixer, and Midlands Today Studio. This was my final tour of Pebble Mill. The building looked quite run down. It seemed such a shame that Pebble Mill was being demolished. 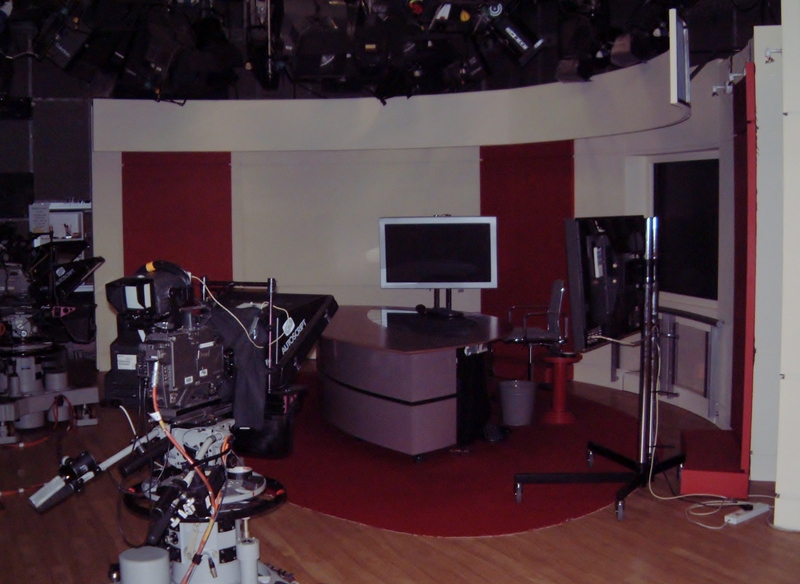 Studio B was used for News and Current Affairs. Midlands Today was broadcast seven days a week from here. On Sundays The Midlands at Westminster broadcast live. The Multicultural Programmes Unit also used Studio B for recording interviews and music. Studio B gallery was open plan to enable easy communication between production and the technical crew. I starting working for the Film Unit in 1976. Back then Film was used for most location shooting. The sound was recorded on a Nagra tape recorder. One of my jobs was to copy from the tape to 16mmSepmag film. The film editor then synchronised this with the picture. After editing the sound and picture it was taken to the Dubbing Theatre. The edited Sepmag would now be on 3 or 4 rolls. The Dubbing mixer would balance speech, sound effects and music to produce the final mix. My job also sent me on location to assist the sound recordist. After a few years I moved to Milton Keynes. I helped set up the Dubbing Theatre at the BBC Open University Production Centre. After 2 years I was missing Pebble Mill. I moved back to Birmingham and joined the Audio Unit. I worked on many TV and radio programmes. I spent much of my time working on Midlands Today. I left the BBC in 1997. Pebble Mill was a very special place to work. I feel very privileged for working for the BBC at Pebble Mill. Studio B was also used for The Cheapest Show on the Telly (Late 70’s I think). This was a somewhat basic comedy sketch show with Lenny Henry and Don Mclean. They even fitted a small audience in there too! It only went out in the Midlands region but some episodes do exist in the main BBC archive. How well I remember Sepmag………..in the little regional studios…….mine was Southampton……. you had to do locking and unlocking of the sepmag bay on telecine during the regional news as not all stories had mixed tracks,some had commag and others were mute! Kept us on our toes in TK!